Ohdeedoh beholds the essence of the mighty T-Rex captured in this eco-friendly, animated toddler toy. We love that this handmade, wooden dinosaur boasts movable parts, making it even more appealing to tiny toy connoisseurs. 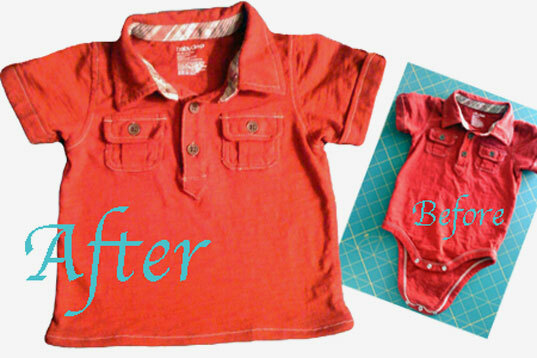 Tiny Decor Blog helps us all save some dough while getting more mileage out of quickly outgrown onesies, with their fabulous Turn a Onesie into a Baby T-shirt tutorial. Blue, Pink, & Green highlights feelgood designs, exploring PLAY+SOFT flexible, cushy, eco-friendly play environments for little ones. If you’re in the mood for a small art project that will make a large impact with the kids, try this clever DIY dragonfly project at Smaller. The New York Times parenting blog, Motherlode, addresses the issue: When Dad Doesn’t Want to Co-Sleep. 249 comments on the post range from informative to humorous.